Going from 20% body fat to under 10%, while putting on muscle – not bad, eh? But as Donald said in his testimonial, it’s the “new normal” for Muscle Hackers. This latest transformation comes from 39 year old Stuart Riches. To check authenticity, this is his facebook profile. “Since my early teens I’ve always been interested in working out. However, my diet knowledge was only rudimentary, so I’ve been able to get a bit muscular in the past, but I never looked shredded. I used working out as a means to stay happy and stress free. However, when I hit around 33 I had injured both my shoulders and started developing osteoarthritis in both of them. As a result I stopped working out since I could no long do some of the movements I used to be able to do, and couldn’t come close to the weights I was used to, which crushed my ego. 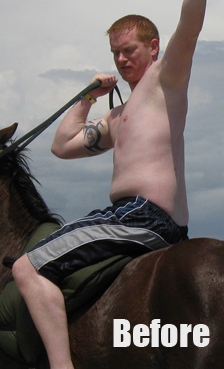 Since I have a desk job as a software developer, I really felt out of shape and didn’t feel good about myself at all. This was really depressing to me. This spring  I decided to do something about it, even if it meant changing the way I worked out. Since I couldn’t lift as hard as I used to be able to I knew proper diet would be the key to achieving the results I wanted. 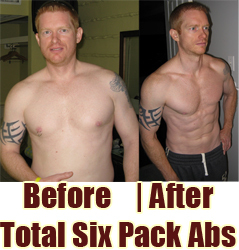 After doing a lot of research and trying a couple different approaches, I came across your website and bought your Total Six Pack Abs guide, which turned out to be the best thing I’ve done for myself in a very long time. The strategy for this diet was so much different then conventional wisdom on this subject, but is was detailed so well and backed up by science that I dove into it with 100% commitment. Given how much I had let myself go (189 lbs, and 20% body fat), and that I’m 39, I wasn’t expecting crazy results that someone in their 20’s would get. But damn…I couldn’t believe how quick I got back into shape. Not only that, but it was so easy for me to follow the diet plan and training that you laid out in your TSPA guide. Within 6 weeks I had gone down from 20% down to 15%. Another 6 weeks (12 in total) I was down to 10% and could see my six pack. In 12 weeks I’d gone from 189 @ 20% body fat with a lean body mass of 151.2 down to 170.8 @ 9.9% body fat with a lean body mass of 153.9, so that means I was actually able to gain almost 3 pounds of solid muscle while dieting. That is unheard of for me. I’ve attached a couple of pics of me. The after pic was taken first thing in the morning before food or coffee, so I’m pretty flat. Unfortunately since I’m so pasty white it’s really hard to take pics that showcase how lean I am. I should try and get a real photographer to take progress pics next time since proper lighting wouldn’t wash me out so much. Since then I’ve been able to get down to 6.6% and hold it there for the last couple months, and I’ve been putting a bit of muscle on since. Even more important is what this has done for my confidence and quality of life. I’m so much happier then I was before I started TSPA. I only wish I’d found this sooner. I’m very pleased to have played a role in your transformation. As a 57 year old male I have been on Mark’s program for about 18 months with great success. Mark, I’m confused. Do I use THT or TSPA?? @Niall. Is the address you used for your comment real? If so, I can send a link to it. @Rein. Depends on your goal. 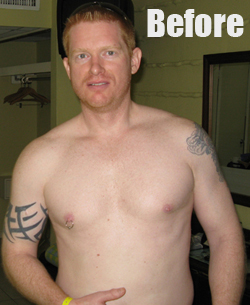 TSPA is a diet and a modified THT workout specifically for shave off body fat. THT is simply a muscle-gaining workout. If you need to lose body fat, go for TSPA. Just had a few questions, was wondering if you can give me insight as the answers I don’t feel are clearly given on your site. Can I get the ripped abs from your ab program while building more muscle like I can with MANS diet and GLAD diet? Would I simply add 300 ish calories to the diet for the muscle growth while keep those abs looking good? Of the 2, which is better, MANS or GLAD? You claim that they are both the best so I am asking you to spell it out! lol Is it a matter of preference? I am on MANS, have been for the past 3 months. As a result, I love the way my muscles looks in the mirror when I work out. I am following your THT workout routine as well, eating about 3000 calories a day. Growth is slow but I am patient (am I missing something you think?). Love the diet too (I can honestly go with way less the 3000 cals a day and not notice it, eat is such a chore!) but am I missing out with not being on GLAD? Awesome Job Stuart!!! MuscleHack Just Works,,,,,,Period!!! @Hank. MANS and GLAD are lean-gains diets i.e. they add muscle without adding body fat. They don’t take body fat off though. TSPA does strip off body fat, and does it very well. And yes, you continue on with your regular training and build while you are on TSPA. Your progress doesn’t stop at all. After you get as lean as you want, you then go on to MANS or GLAD and use the cal calculator here on MH to know how many cals you can have without putting fat back on. MANS and GLAD are equally effective. It’s just a matter of personal food preferences. Go with what you’d like to eat on a daily basis. Hi , Mark how you.I just wanted to know what’s your take on smoothies,& can you please send me some good recipes.I work in retail so I don’t have a lot of time on my hand to prepare proper meals.Some muscle building smoothies.